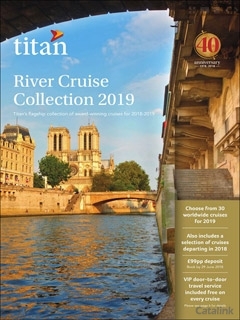 To order a printed copy of the Titan Travel - River Cruises brochure, simply click the Request button below. Enjoying five star luxury whilst on the move makes for a breathtaking way in which to experience the charms and excitement of a new destination. Titan's River Cruises comprise a tantalising selection of enchanting waterways and exquisite vessels that will glide you through the thrill, intrigue and wonder of some of the world's most captivating environments. Be inspired by a fine–tuned itinerary ethos that guarantees the highest degree of comfort and diversity. The river cruisers themselves average a capacity of 130 guests – ensuring that you can still make friends whilst enjoying a more intimate and exclusive atmosphere. The ships also boast extravagant amenities, beautifully crafted interiors, onboard entertainment, extensive facilities and gourmet cuisine. The destination routes available to explore range from the rich histories of the Rhine and Danube to the natural splendour and cultural intrigues of the Yangtze and Mekong. If you're tempted to induge in a comprehensive journey of discovery, why not experience the magic of a Grand European River Cruise and bask in the infinite pleasures of a 29 day voyage? Renowned for their experience and professional escorted tours, Titan's River Cruises feature some of the most authentic excursions available when you step ashore. Explore the wonders of each culture and location in depth, whether independently, on foot or by bike. Whether you've always wanted to experience the joys of a meticulous river cruise or whether you're a seasoned veteran looking for inspiration, order your Titan Travel - River Cruise brochure now and get exploring. By pressing the Request Printed Brochure button you give consent to Titan Travel - River Cruises (and their Data Processors for the specific purpose of delivering your literature) to send you their Brochure .